When the Leica SL hit the market in October 2015, it caused a whirlwind of excitement. Here was the mirrorless full frame camera system that professional photographers had long awaited. I visited the Leica Store in Mayfair (London) and played with the demo unit. I was instantly hooked and placed my name on a wait list. On that day, I broke from years of Nikon shooting and transitioned to Leica, believing it was the future. Today, nearly two years to the day since the SL was released, I am not so sure. While I've had a remarkable experience shooting the Leica SL, there is one major area where the SL lags behind the competition, and where my patience has nearly run dry....lenses. At launch, Leica only had one lens for the SL system - the 24-90mm lens - and promised two additional lenses would follow shortly (a 50mm prime and 90-280mm telephoto). To offset this lack of lenses, Leica also touted how the SL was versatile in it's ability to use lenses from Leica's other lines - including the M and S lenses - when paired with an adaptor. Leica seemed to realize that no one was going to buy a camera system with only one lens option and was trying very hard to cater to photographers by offering cross-system compatibility. While that's all fine and good, using other lenses comes with some disadvantages - most notably the lack of weather sealing and auto focus. For a landscape photographer that is regularly shooting in poor weather, this was a point of concern, although I have used the adaptability in my SL setup. A year after launch, Leica had come through on the promised lens releases and all was well in SL-land. Three SL system lenses were available, and they had more on the way. 2017 promised to bring the release of four additional system lenses, including a 35mm, 75mm, and 90mm prime lens, along with the 16-35mm wide angle that landscape photographers lusted to own (hint hint.... that'd be me). Quietly, something happened. Lenses stopped showing up. According to the roadmap above, by October 2017, we should have at least two more lenses available, with two more coming any day now. Instead, Leica silently pushed off the release date of these lenses. Now only one lens, the 75mm f/2 ASPH, is slated to arrive in 2017 (maybe? still no word on it), with the other three lenses listed as "coming soon" or "spring 2018." Would anyone really think that's a sign of a healthy camera system? 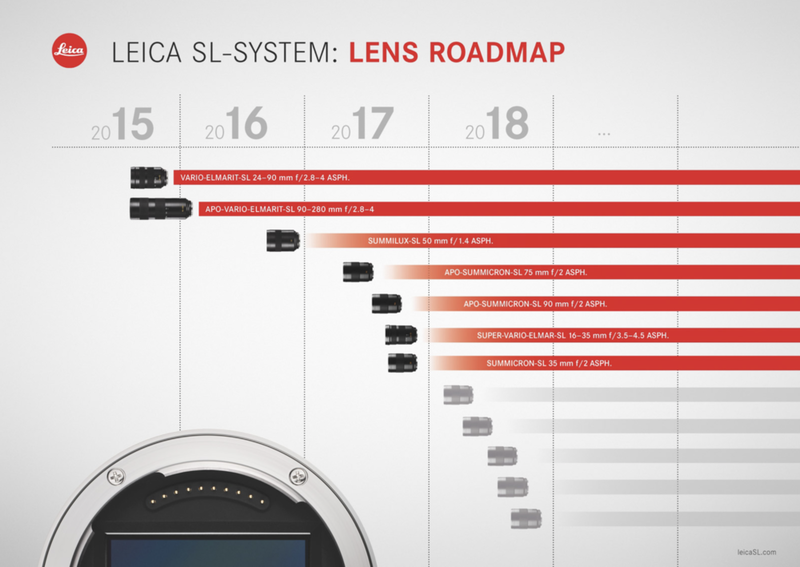 The rational side of me argues that Leica is trying really hard to produce quality lenses for the SL system, which is why they have been slower in the release schedule. They want only the best lenses on the market, and are busy perfecting them..... right? Seriously? Instead of announcing or releasing lenses for the SL system, it seems the engineers in the glass department of Leica have been on a craze to re-release old 1930s lenses. This is a slap in the face to all of the people who invested in the SL system early. Leica has prioritized these money-grab lenses - collectors pieces for people who will never shoot the lens - over lenses for people who actually want to make photographs. Fuming over the announcement of a 1930's lens re-release, I decided to stage an armchair war and look up other manufacturers and their lens release schedule for new systems. I compared four other systems - the Fuji GFX 50s, Hasselblad X1D, Sony Alpha A7r, and Pentax 645z. What I quickly found is that Leica is behind the curve. The Hasselblad X1D, which is a natural competitor to the SL, only has 4 lenses currently on the market, but it also has been available for 440 days, compared to 750 days for the SL. A comparison of camera systems by release date and current lens availability. In every metric, the SL system is behind the competition. It's worth noting that Sony already had some lenses on the market when they released the Alpha A7r, but they have continued to release new lenses on a somewhat routine schedule. Lack of lenses isn't the only problem facing the SL community - price, speed, and size are also major factors. The SL lenses are massive, and while they may deliver great performance, in an era where competitors are releasing significantly smaller lenses, it's hard to get excited to haul around big glass. The lack of motivation to drag a heavy lens also stems from the fact that these lenses are surprisingly slow; both the 24-90mm and 90-280mm lenses have variable apertures ranging from f/2.8-f/4. Coming from a company that has released f/0.95 lenses, I would expect to see these big heavy (and expensive) lenses maintain at least an aperture of f/2.8 through the zoom range. Finally, we have the price. These lenses are eye-watering expensive, even by Leica standards. In an effort to keep the SL relevant in the mind of prospective buyers, Leica recently slashed the price of the camera system. In my mind, this was a sign of bad things....companies only slash prices of a camera when it is doing poorly in sales or about to be replaced. There are no rumors of a "SL2" system hitting the market anytime soon, which suggests to me that current sales are poor, particularly compared to the M10 release. With the new price adjustments, the SL sells for $500 less than the old Leica M240 ($5,995 vs $6,595). In what economic universe does a camera made in 2013 sell for $500 more than a camera made in 2015 with more features? I will pause here to say I am not Leica bashing--- I LOVE my M240 and the Leica M system. I just think Leica has stumbled with the release of the SL system, and barring a dramatic turn-around, I would not be surprised if Leica refocused back to the systems that have been very successful. Leica does not release sales figures to the public, so we're left to speculate. Price slashes.... delayed lens releases.... a clear focus on producing collectors pieces and historical re-releases.... behind-the-market performance in delivering new options. Are these signs of a healthy system? Why would anyone buy an SL now? What consumer is looking at the limited options for organic system lenses and is excited by the offerings? And with competitors offering systems with more lenses, more capabilities, and better specs at a lower price, Leica risks loosing adopters of the SL system to newer cameras. Personally, I believe the slow release of lenses may be the doom of this system. For the price of joining the Leica SL club, one could easily invest in a 50 megapixel medium format camera (Hasselblad X1D). I have been insanely frustrated by the slow release schedule of the SL lenses - so much so that, combined with recent issues with my gear - I'm considering jumping ship and heading for pastures that have proven to be a bit more reliable in past years. What do you think? Am I being too harsh? Or is the Leica SL still a worthy buy?